Lets take an example-Suppose you are working for a MNC and its been more than 5 years but you are almost getting nothing in terms of salary.You became frustrated when you see your friends or even juniors are getting a good amount.What will be the thoughts in your mind.First, May be I am not good enough,Its my bad luck which is not leaving me and many more..Then slowly you realise that you were never happy doing this and you already know that this is not your ultimate goal.You want to do something big.And you got to know that you have some talent which only few people have and you start thinking of doing something else. 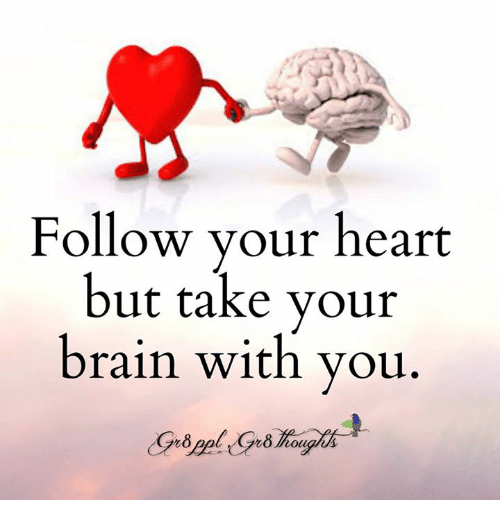 These are the thoughts in your heart but how can we forgot about our dear brain who is ready with his facts and figures to kill our thoughts and making the situation messy and you a big big mess. Our brain always contains the practical thoughts which it should because they are equally important.See life is not a movie, right.We have to be little practical so that we do not loose everything we have got.Lets come to the point and realise what our brain must be thinking - what if I fail, what others will be thinking, what if I become financially unstable and so on..
Guys trust me this is the time when you have to be calm and take care of mainly two things-first one is set your priority and the second one is have a backup.Yes..you should always have a backup..PLAN B.You need to think and decide.You need to make full use of your brain and heart.They were earlier making your life messy but now you make use of them.So the bottom-line is first set your priority and then have a backup and just go and try once, if you can. Maintain a balance as Balance is the key..Choice is yours...Good Luck!! Juhi Nigam is earning by writing this article. You can also earn by writing articles.